This week we skip ahead to June 6th, 1987, for the occasion of the Fourth Annual Golden Awards Banquet put on by The Motion Picture Screen Cartoonists, Local 839, I.A.T.S.E. (now The Animation Guild). This set of interviews was done at Local 839’s former building on Lankershim Boulevard, in North Hollywood. The videos are obviously taken from a more carefully done production than the last set, though the resulting content is basically the same. Lucifer [Benvenuto?] 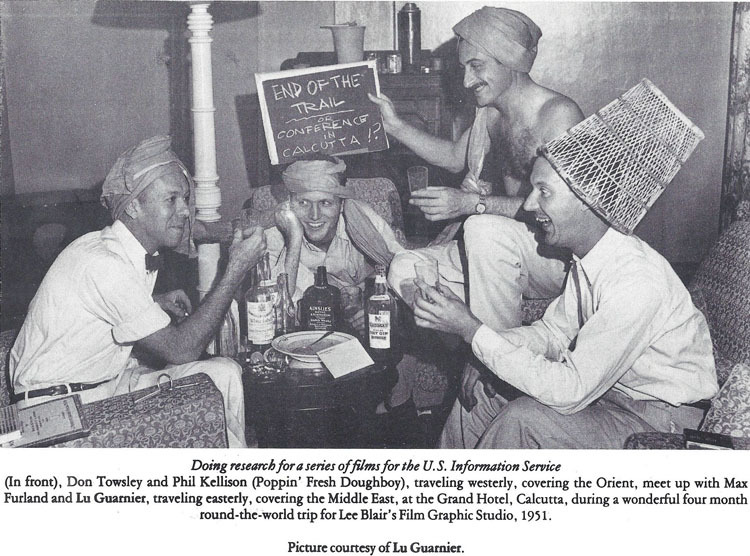 Guarnier is not a name commonly associated with the Golden Age of Hollywood Cartoons, though he did serve his apprenticeship at Schlesinger before World War II. He was a strong presence in post-war New York animation, though, animating and directing on industrial and training films, as well as commercials, series TV, occasional TV specials and two feature films. Guarnier was born in the Bronx and grew up in Manhattan, in the Washington Heights area, graduating from George Washington High School. In 1931, he moved to Los Angeles where his father had earlier went to find work and attended junior college. He then got a degree from UCLA in 1936, in Art Education, which was “the only art course they had.” (His mother felt that, “If a son couldn’t be a doctor, be a teacher.”) In January 1937, his Uncle Benny got him an interview with Leon Schlesinger, during which, “Schlesinger reached down to pull open a drawer and [said], ‘Look at all these applications I got!’ That sort of a thing. Anyhow, he hired me [as an inbetweener] at the munificent sum of $6.00 a week, for the first week that is. Then you got a 100% raise to 12.” (To put that in some context, in 1931 Jack Kinney was hired at Disney as an inbetweener at $20.00 a week; in the early 30s, $12.00 a week was what opaquers got—essentially a minimum wage job.) After a few weeks, he was taken on as Chuck Jones’ assistant after Jones and Clampett were sent out by to the Iwerks studio in Beverly Hills, which was doing work for Schlesinger; there he worked on Clampett’s directorial debut, Porky’s Badtime Story. He left Schlesinger’s in early 1941 after being drafted into the Army, becoming an animator at the Signal Corps’ Training Film Lab based variously in New Jersey and New York. He worked under Ellis Smith and Robert Leffingwell, alongside such animators as Herman Cohen, Bob Givens, George Peed, Lars Calonius, Myron Waldman, and Master Sergeant Jack Zander. After the war, following a brief stint working on comic books, he was hired by Lee Blair and Bernie Rubin’s Film Graphics, which did industrial and training films before getting into TV spots. (Rubin was the brother-in-law of Lu’s girlfriend, Peggy [Mannon?].) There he was given complete responsibility for each project and was even able to travel around the world. After 8 years, he left to go to UPA’s New York studio as an animator (actually they hired him as a supervisor, but that didn’t work out). After UPA shut down 4 years later, he spent the rest of his career as a freelancer. His later credits includes animating on the TV special of Maurice Sendak’s Really Rosie (CBS, 1975), which he is especially proud of. As to features, he worked on John Hubley’s Everybody Rides the Carousel (1975) and Fred Wolf and Chuck Swenson’s The Mouse and His Child (1977). 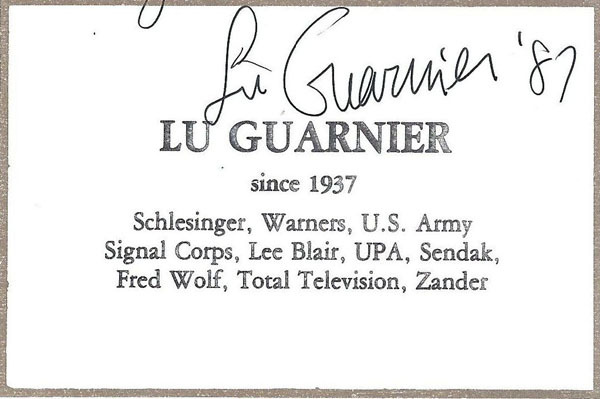 Guarnier is also credited with directing on two TV series: King Leonardo and His Short Subjects (1960-64) and Tennessee Tuxedo and His Tales (1963–66), both for Total Television. For more on Guarnier, check out Michael Sporn’s brief obituary here, which is lovingly amplified with recollections by those who worked with him and his niece. Some of the gag drawings mentioned there regarding his corner window space at UPA are found on the Steve Worth’s Animation Resources blog here. 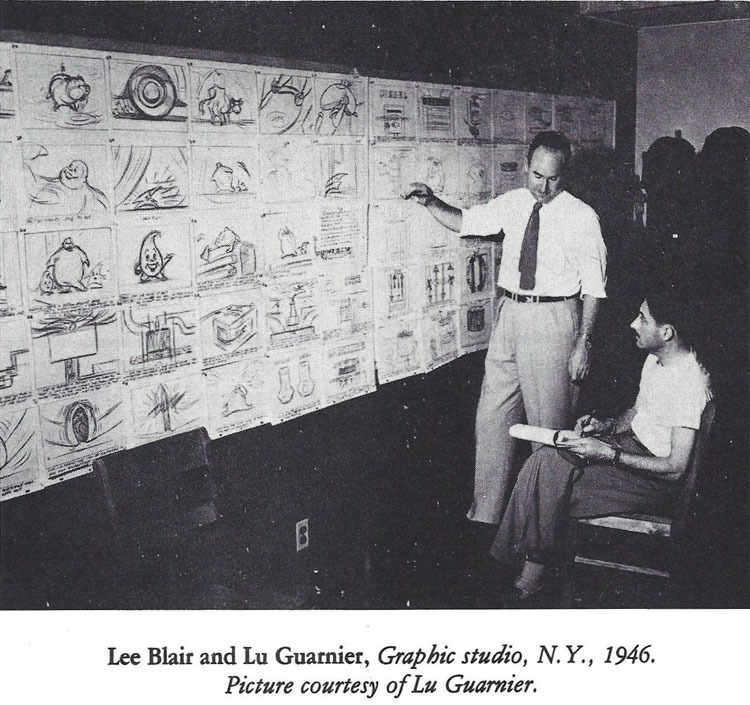 References to more of Garnier’s work, including some of his animation drawings, can be found on Sporn’s Splog. Next week: Jay Gould and Wilma Baker.